Full text of the Communique from the London Conference on Somalia at Lancaster House on 23 February. Things are moving forward, of course there are obstacles also. Now undeniably people's mind is focused on development, it could be personal (such as starting business, or getting education) or being part of the huge infrastructural investment that is going on. The vibe is positive, and so much different than the diaspora politics. In fact, I realized how much one gets into life or the act of living, politics is not the center of life. On the other hand small things reminds you how things should be better, yet it is not. For example, it is sad and unfortunate for a city that is as big as Addis, may be only one traffic light is working, or it could be something I just experienced tonight, which is so unreal and unproductive, to the point I started to laugh, where Kebele secruity personnel were standing in the vicinity of Edna mall cricle, and searching/frisking pedestrians (as if someone is going to go into a club). I am sure there is a better security measure than a couple of Kebele personnel frisking walkers, creating the vibe of the Derg regime in the mindset of the people, and actually defeating the purpose of good investigation. So minute stuff like that, when combined overtime it creates a jaded, and a sense of vulnerability in the populous. At least it did for me, for a moment. But overall things are looking up, and feels great to be a part of the change. Richard Falk Richard Falk is the United Nations Special Rapporteur on Palestinian human rights. The 37th birth day of the popular struggle of the Tigrai people, Lekatit 11, was colorfully celebrated in London. The event also raised over 17 thousand British Pounds in bond sales for the Hedase Dam! IGAD Countries' Ambassadors to the US Launch a joint working Forum! Prime Minister Meles Zenawi has flown to London to take part in the Somalia Conference. Addis Ababa, February 22 (WIC) � The coordinated military operations to wipe out al-shabaab in Somalia have left fighters of the al-Qaeda linked extremists in �disarray�, a government official says. Amen Teferi Feb 19, 2012 A couple week ago, watching the televised session of the Federal Parliament and listening to the government quarterly performance report of the Prime Minister, wherein he respond to the queries and concerns of the MPs prompted by his report, I chanced to hearken to an ever intriguing issue related to the decries made by some international organizations against the Ethiopian government. 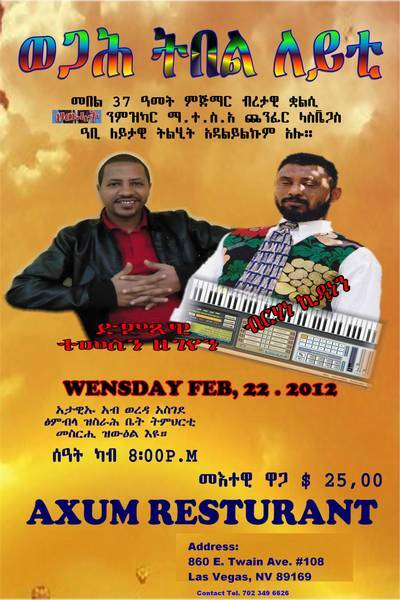 በአገራችን ላይ የሻእቢያ ማቆሚያ ያጣ ሽብርና ትንኮሳ መንስኤው ምንድነው? At this point in time, the idea of a return-in-kind response to the one man regime in Eritrea acts of terror in Ethiopia is really meaningless. We all know Ethiopia is begging to sit down and talk while bleeding we might add! And we all know Isaias Afeworki is not someone who feels pain if a division of his army is annihilated! What may work is to close all doors and work hard to remove him from power before he gets emboldened yet again to cause us more harm. It is easy to foresee the West siding with him down the road to thwart China's foray in to Ethiopia and beyond in Africa! 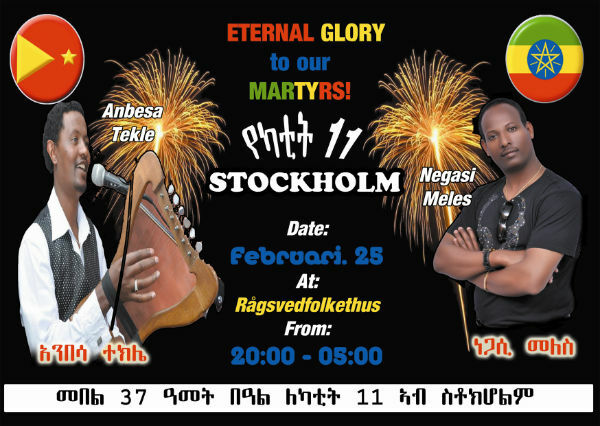 Stockholm, Sweden Tigrean Community Lekatit 11 Invitation! Las Vegas, Nevada Tigrean Community Lekatit 11 Invitation!